The tea plant, Camellia sinensis, is of particular importance to humans, and the consumption of tea has a long history of over 2000 years. Currently, tea is one of the most popular beverages worldwide. In recent years the subject of tea has attracted a great deal of attention. As well as the use of tea in traditional medicine, modern biochemical research has shown the potential application of tea and tea products to disease prevention and therapy. 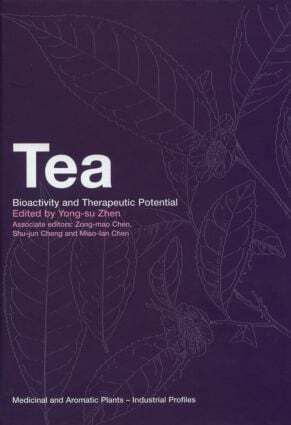 The goal of this book is to cover all relevant aspects including botanical identification, processing and major categories of tea, physiological and pharmacological effects, and experimental therapeutic effects. The therapeutic applications of tea based on traditional Chinese medicine are also included. The contributors are renowned experts from botanical, agricultural, chemical, biochemical, and medical circles. Tea: Bioactivity and Therapeutic Potential will be an invaluable reference source for physicians and all professionals in pharmaceutical, agricultural, and food research and development industries as well as anyone who is interested in the potential medical applications of tea. "The book is a well-organized and superbly researched publication well suited for researchers engaged in further studying the biochemical basis of the functional effects of tea extracts or components and for healthcare professionals who are inclined to use traditional medicinals as adjuvant therapy or promoting healthy living. Tea aficionados will also find … this book an easy read in learning the botanical classification and the technical art of tea processing."